ysabetwordsmith | Poem: "The Fool at the Threshold"
Poem: "The Fool at the Threshold"
This poem came out of the August 1, 2017 Poetry Fishbowl. It was inspired by a prompt from redsixwing. It also fills the "meditation" square in my 5-1-16 card for the Solo Celebration Bingo fest. This poem has been sponsored by daisiesrockalot. "The Fool at the Threshold"
at the edge of the cliff. is to begin the Fool's journey. 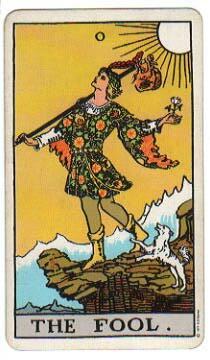 The Fool is the first card in the Tarot. He is accompanied by the white dog of motivation. Meditation is one way of learning how to read Tarot cards. Understand that when you interact with a card, its energy tends to manifest in your life, both the positive and the negative. If you're not prepared to handle it, the results can be upsetting, which causes some people to think that Tarot is dangerous. So is a bicycle if you don't know what you're doing. A very good piece of advice is to study the cards, at least the Major Arcana, one at a time, preferably one a week but you can go as fast as one a day if you think you can handle that ride. If you're still interested, then follow the steps and explore an exercise in Tarot. Yay! I'm plenty familiar with Tarot, so you can ask for this kind of thing any time. Interpretations are diverse. Everything on a card means something, but people may have different ideas about what it means. A particular quirk of the white dog is that it can be considered helpful, harmful, or indifferent. I liked the motivational aspect for this context. How do you tell which to choose when? In poetry, I use whatever supports the theme. In readings, I use triangulation -- looking for repetition of motifs across different cards, and between card and position.